The Blair Digital Chanter is always in tune, at pitch and ready to play. That’s already a huge advantage for recording bagpipes, and most importantly you’ll hear how everything sounds on a full set of bagpipes, or smallpipes, without losing time on tuning. The Digital Chanter always holds it’s pitch and with some extra mixing you’ll have the ability to create your own signature sound. Here’s a rundown of what’s required and tips on how to improve your bagpipe recording. 1. What’s an audio interface? 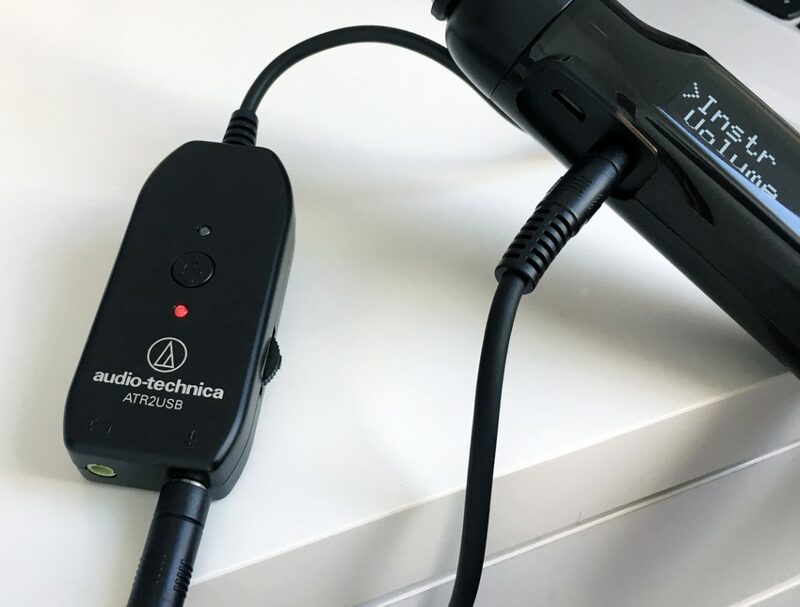 An audio interface is an additional piece of hardware that connects the chanter to your PC or iOS/ Tablet. It converts the chanters audio signal (analog) into data (digital). The interface provides better sonic quality than a computers sound card, inherits the workload of converting the audio for your PC, and depending on the type of interface can accept a variety of inputs (microphones, smartphones, keyboards). The Chanter’s MIDI output (USB port) doesn’t send any sound, only data and is not used for sound from the chanter. Below are two examples of interfaces; one quite cheap and the other more expensive. The main difference is how they convert audio into your PC, and if they produce any latency. That means if there’s any delay when you play the chanter and how long it takes to hear the sound back via your recording device. Most small interfaces include a headphone socket to solve latency issues. 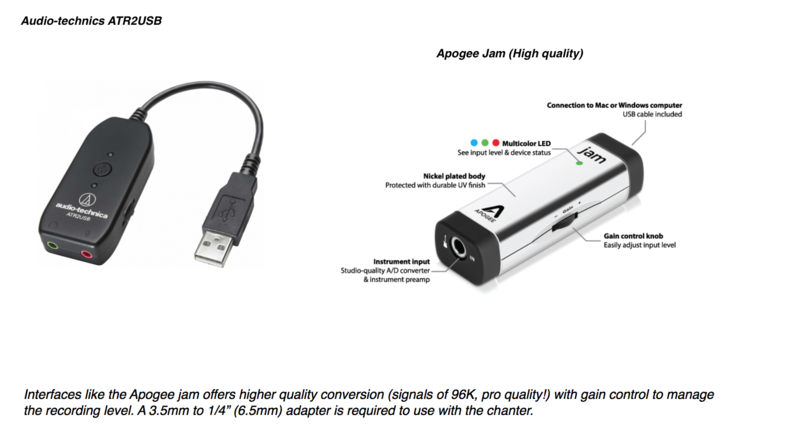 Below there are two interfaces; the ATR2USB is around USD$30 and the more expensive Apogee jam around USD$100. The first cable to connect is the output of the chanter to the input of the interface (as below). 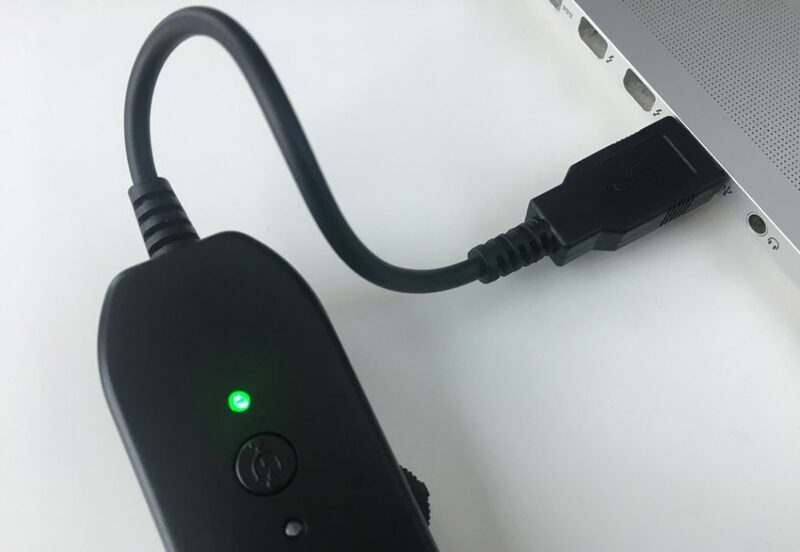 After the audio cable, connect the interface to the USB input on to your PC. When all is connected launch your PC audio software and the interface should be listed as an input device. If it’s not, additional drivers maybe required for your PC from the manufacturers website. 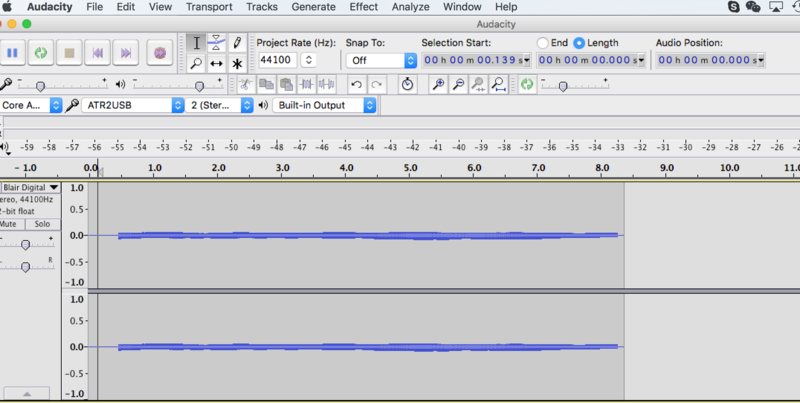 This is a program that captures the audio so you can playback, edit and adjust the sound afterwards. Technically they’re called DAW’s (Digital Audio Workstations) for multi-track recording which is the practice of layering multiple tracks at once, or creating a full ensemble over time. More recently DAWs have adopted signature names like Garageband, Logic Pro, Cubase, Cakewalk etc. The programs mentioned above are all commercial and offer an extensive list of functionality, however if your budget is limited or just starting out Audacity is free for both Windows and Mac platforms. Audacity is a multi-track recorder and editor, compatible with the Blair Digital Chanter and while not as intuitive like the commercial programs still capable of advanced recordings and editing. The goal should always be to capture the sound well, making sure the bagpipe is balanced (good drone sound in proportion to the chanter). Carefully consider the type of microphones chosen if you’re recording the traditional instrument, their characteristics, positioning and the environmental acoustics of where the instrument is being recorded. I’ve used both cheap and expensive microphones and it’s possible to achieve great results with both if they are placed correctly. The Blair Digital Chanter produces a dry sound, just like an electric guitar or keyboard, and provides a strong foundation you can control to create a signature sound. The first step to enhance a Bagpipe recording is to add a small amount of reverb which will help smooth the high frequency harmonics, add space, ambience and presence to your instrument. We often listen to bagpipes in environments that naturally reverberate so the aim is to recreate just that. I’d suggest a very subtle reverb so the sound is still crisp and clear, overdoing reverb destroys the clarity. EQ The most powerful tool to use. A small amount will enrich the chanter and drone sound, try adjusting frequencies of 8K and above by a few decibels to hear the difference, or increasing frequencies on a gentle curve from 100-800Hz to create depth in the drones. Pitch. This factor has undoubtedly changed how audio equipment has performed when recording bagpipes over the last 15 years. Cheap digital recorders struggle when the pitch is high to reproduce an authentic bagpipe sound due to their lower quality ADDA converters (analog to digital and digital to analog). The result is a harsh-tin like reproduction, compared to high-end digital converters (482Hz and above). For a warm recording that’s not reliant on a high pitch, try lowering to around 476Hz or 466hz, even 440Hz. The difference is remarkable. 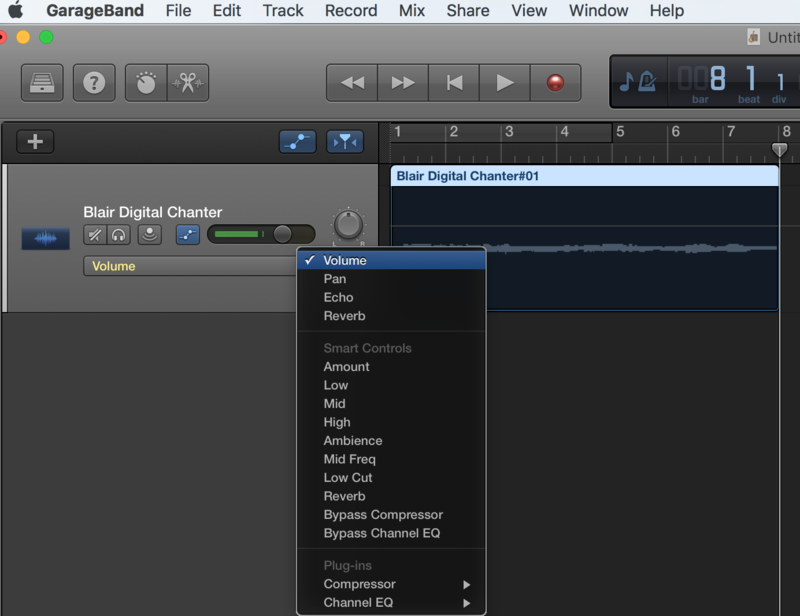 – Add a small amount of EQ and Reverb to enhance the sound. That’s a very, very brief rundown of the equipment and a few tips on how to record. If there’s more questions or help required shoot through an email. Enjoy recording with the Digital Chanter!